After delivering my 1lb, 2oz baby boy, twenty-three friends, family and church members met him before I did. 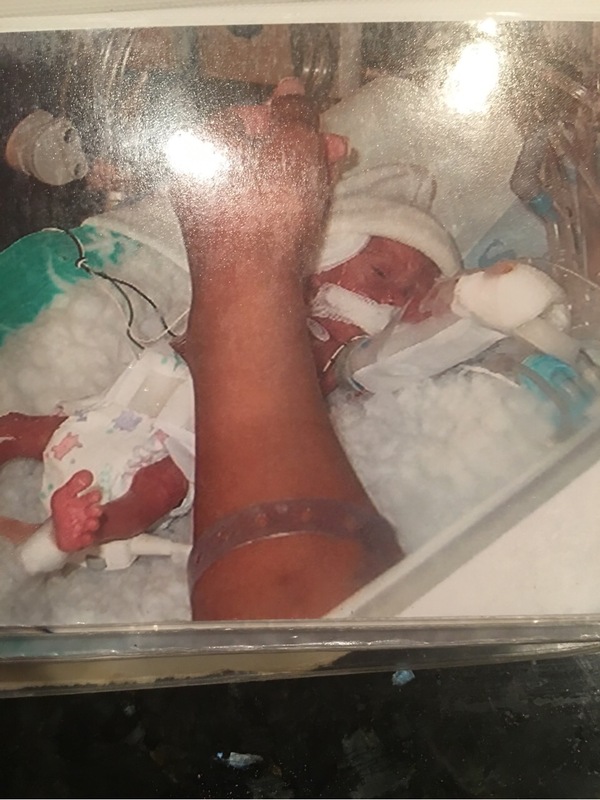 After they would meet him, some would come back to my room in tears, some prayed over me and some were in awe of the little miracle that was in the NICCU, (Newborn and Infant Critical Care Unit). After two days in the ICU, I was finally well enough to see my son and I was wheeled down to the NICCU. I didn’t take in my surroundings at the time because all I wanted was to see was my baby. When I walked in and saw him in his little incubator my heart melted. My baby, my boy, my beautiful boy. Because he was delivered so early, his little eyes hadn’t opened yet. He was on the smallest ventilator I had ever seen and had tiny tubes coming out of his hands and feet. His diaper was smaller than the palm of my hand. I watched in awe, his tiny arms and tiny legs. My God, thank you. Thank you for making me a mom. All praises to you, for my baby. Whatever he was going to face while trying to survive and get out of the NICCU, I knew he could do it. We would do it together. He was the littlest love of my life. I now understood all the things mothers talked about. I had just turned twenty-one and I was still figuring out life, but what I did know was that this baby was my life, my everything and I loved him so much. I loved him more than life, itself. I was going to be the best mother to him. After one week in the hospital, I was finally well enough to go home. I had to buy a portable blood pressure monitor because my blood pressure was still high, but it was stable enough that I could monitor it at home. Healing from my C-section, I tore open my incision. I had a hole, the size of a quarter, in my incision and my mom had to stuff gauze in the hole every day. We would then have to take tweezers and pull it out and change the dressing, (oh my gosh, right)? My mom and I visited the hospital several times a day. My mom was super-grandma and obsessed with her grandson. All I wanted to do was be by my son’s side. 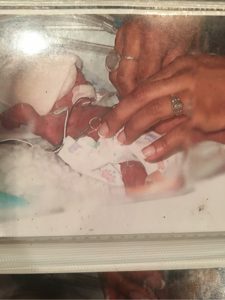 I wanted to hold his hand through the hole in the incubator, I wanted to watch his mouth move as he cried into the ventilator. I needed to know all of his vitals. Was he pooping? Was he peeing? Cold? Hot? I had to know every detail of my son’s precious life. If I could have slept in the NICCU every night, I would have. On top of visiting several times, I called about one hundred times per day. I called at all hours of the day and night. In the middle of the night, while I pumped milk, in anticipation of my son coming home one day, I called to check his stats and to make sure he was all good. I needed a name for my son. His name tags had his last name, but no first. After my mom and I went through the Bible, I found the perfect name. I took it from from the tribe of the Levites. I named my son, Levi. The most perfect name in the world. On day three, Levi hit a milestone. I called during one of my middle-of-the-night pump sessions and Levi and my favorite nurse excitedly told me that Levi opened his eyes for the first time. I almost jumped out of my skin, I was so elated. I thanked God for my little miracle and the next morning I was up bright and early to get to the hospital so Levi could finally put a face to the voice he had heard for over six months. His little, tiny eyes were the most beautiful things I had ever seen. I could not believe this tiny human was mine. Changing my precious angel’s tiny diaper.
. But, I knew my chance to hold him would come again, and it did. However, no mother wants to hold her baby for the first time in the manner in which I did. A few more days passed and Levi hit another milestone! When I went to see him, he was no longer intubated! He was only on a c-pap machine, (a breathing mask over the nose) and I could clearly see his little mouth for the first time! The nurses were blown away and so was I! As I went to change his diaper, I noticed a couple of things. He was very pale and there was a little bit of blood in his mouth. I immediately asked the nurses and they attributed it to something that I cannot remember. I was in awe of my baby boy. He was moving mountains with his strength and he was moving my heart in ways that I never knew were possible. I remember those words so vividly. I immediately started questioning how he would have caught a cold. Did I not wash my hands thoroughly enough? I had the sniffles, but I washed the hell out of my hands and arms every time I entered the NICCU. Did my mom make him sick? Did one of the visitors make him sick? So many questions swirled around in my head. I needed to find the reason why. The doctors ran some tests and started giving him potassium and other medicines to try and help his cold. I was relieved and happy they were going to help him get better. I touched his hands, feet and head. I had not seen or touched Levi without being protected by his incubator. I took in every second. He slowly moved his feet and tiny fingers, but he was not feisty like he had been a few days before. I knew he was going to be okay. He had made it this long; he is my miracle, my fighter. The next morning, when I walked into the NICCU and Levi was still uncovered, his coloring was starting to turn a bit. I started to worry. The doctors still had no answer for me. They told me he was not getting better and that they were trying everything they could. Through the day, as I went from the waiting room, to the NICCU, to the nursing room, to pump… all I could do was pray. My mother and I prayed like never before. We prayed all day and into the night. Levi was my miracle, but now he was in desperate need of a miracle. Time continued to pass and Levi continued to get worse. I just knew God was going to pull him through. God HAD to answer my prayers. Miracles happen everyday and I knew I was going to have a story to share. That night, as Levi continued to deteriorate, I refused to go home. I could not leave my baby. I was never leaving him again. Swedish allowed me to stay the night at the hospital to be near Levi, especially if there was any change. It was a long night. I called up to the NICCU every five minutes from my hospital room and every time they had no good news. At 6:00am, the phone rang in my room. I knew this was not the phone call I wanted to answer, but I had to. I picked up the phone and they told me to call my family and close friends because Levi was not going to make it. I remember calling my mom and close relatives. I told them they might want to come up to the hospital because Levi was going to die. I do not even think I cried as I called them. I was in shock. I entered into the NICCU and there was a priest and some of Levi’s favorite nurses. The nurses were all crying. They asked if I would like to hold my baby for the first, and last, time. As my friends and family gathered around and the priest blessed Levi, I remember looking at him, at his almost grey-colored skin. I kissed him over and over. I stroked his hair and my tears dropped over his face. I smelled him, I can still recall his smell. It was sweet and beautiful. I sat there holding my son while he was being kept alive by a ventilator. I chose not to see him take his last breath. I am not sure why I did not want to see. Honestly, I think I was scared. I did not want to see him die, I did not want to see him possibly gasp and fight for air. I did not want that memory. I was not going to see my son leave me. My aunt stayed behind and later told me that she begged for the Lord to take her instead. She watched as my beautiful boy take his last breath. I hugged the nurses, gathered Levi’s things and I left the hospital with nothing. No baby, no excitement to go home and call and check on my baby. I had nothing. To leave the hospital knowing you would never return to see your baby is a pain I do not wish on my worst enemy. I was not a mother anymore. The next day, I remember sitting in the dark of my room. I would cry in anger. I was SO MAD. I was mad at God, I was mad at the doctor, the nurses, my OBGYN, I was angry at the world. Why did God not hear my prayer? Why did the nurses not know he was sick ahead of time? Why did they not take better care of him? Why, why, WHY? I had lost everything. All I had to remember my son, was a gigantic hole in my incision, and an even bigger hole in my heart. I had pumped over one hundred bottles, in three weeks, for my baby boy and they will never be used. The funny thing about being broken and being young is that you don’t know how broken you are until you are old enough to know what being broken really means. After that day, I didn’t grieve again. Yes, I cried, but I never grieved the loss of my son. His funeral was small and quiet. Levi’s favorite nurses came, along with close family and friends. Once again, I was numb. I sat there with no emotion, no response. I was sad, but I was more angry that my son was gone. I picked out the perfect headstone for my baby, the perfect outfit and he is buried at a local cemetery, in the “Kid Garden.” He is in good company with other little precious souls. After the funeral, I did not know what to do. I wanted the pain to go away, so I did the only thing I knew how to do. I carried on. I went out to the movies with my friends as if I didn’t just bury my son. It was the only way I knew how to block my hurt. I was broken, but unable to express my deep grief and hurt. Because Levi was so underdeveloped, he developed a hole in his small intestine. Blood and stool leaked out into his entire body and he became septic and could not overcome the infection. I donated over one hundred pumped bottles to a mother who needed breast milk for her baby. I spent the next year functioning like normal, but deep down inside I was so hurt and confused. I still did not understand why God took my baby from me. I thought I was going to have a beautiful story to share. What did I do to deserve this? I felt like I was being punished. From everything I went through, I wasn’t sure if I could have children again. I was lost and hiding the depth of my sorrow. Like I said before, I didn’t understand why I went through what I went through, until years later. Even after becoming pregnant and delivering Karmyn, my healthy daughter, I was still bothered. One day, like magic, God revealed how his plan was the most Devine and perfect plan for my life. What I went through was traumatic and heartbreaking, but it was nothing short of the greatest blessing. He revealed that I did have a story. I had a happy ending. If Levi would have survived, my life would have been drastically different. I probably would have been struggling to care for my premature son. The nurses always told me he was going to have a multitude of problems and complications due to how under-developed he was. If Levi would have survived, I probably would have married his father, just because it was “the right thing to do.” Therefore, I probably would have never met Marcus. The timing in which Marcus and I met is nothing short of God’s perfect timing. He came into my life and he changed my life. He helped me see that God is a miracle worker and we were brought together because it was a part of his plan. Not my plan, but his plan. He sent Marcus to make me a mother, five times over. To make me a wife and a better human being. Levi was absolutely a part of the plan, but now I understand the blessing within his loss, the blessing within the storm. I will forever be affected by the loss of my first son. As a matter of fact, I wish I would have gone to grievance counseling to help me filter through my feelings and help me grieve. I went from sharing my story about my loss to being uncomfortable to share my story. I felt as if I was beating a dead, sad horse and no one wanted to hear my sorrow. Once I married Marcus, I became ashamed to share my story. I felt that because my son wasn’t his, people would judge me and my story wouldn’t be received properly. But, no. My story needs to be heard. This is my story, my tragedy, my truth, my struggle, my testimony and it is a part of me. Levi was, and still is, a part of me. I cannot deny my son. I cannot hide what I went through. It is the reason why I am who I am, today. Levi will always be my first-born. He will always be my baby. Sharing my story has helped me grieve. Even as I write, more things are being revealed. More pieces of a broken puzzle are being put together to further become whole. I hope by sharing my story I can help others share theirs. I want them to know, you must grieve. Take the time to grieve, don’t let anyone put a time limit on your sorrow. It is okay to share your sorrow, because there are people out there who know your sorrow, who walk in your sorrow, daily. There is power and healing that comes within your story. No matter what you’ve been through, there is always a blessing. During that time when I felt as if God had abandoned me, he was right there beside me the entire time. I still have moments of intense sorrow, I still sometimes wonder what if Levi would have survived. But those moments are far and few between because I cannot help but thank God for the five beautiful miracles that surround me today.